Before its brief mission ended unexpectedly in March 2016, Japan's Hitomi X-ray observatory captured exceptional information about the motions of hot gas in the Perseus galaxy cluster. Now, thanks to unprecedented detail provided by an instrument developed jointly by NASA and the Japan Aerospace Exploration Agency (JAXA), scientists have been able to analyze more deeply the chemical make-up of this gas, providing new insights into the stellar explosions that formed most of these elements and cast them into space. One group of elements is closely tied to a particular class of stellar explosion, called Type Ia supernovas. These blasts are thought to be responsible for producing most of the universe's chromium, manganese, iron and nickel -- metals collectively known as "iron-peak" elements. An important open question has been whether the exploding white dwarf is close to this stability limit -- about 1.4 solar masses -- regardless of its origins. Different masses produce different amounts of iron-peak metals, so a detailed tally of these elements over a large region of space, like the Perseus galaxy cluster, could indicate which kinds of white dwarfs blew up more often. Taken together, the findings suggest that the same combination of Type Ia supernovas producing iron-peak elements in our solar system also produced these metals in the cluster's gas. This means both the solar system and the Perseus cluster experienced broadly similar chemical evolution, suggesting that the processes forming stars -- and the systems that became Type Ia supernovas -- were comparable in both locations. 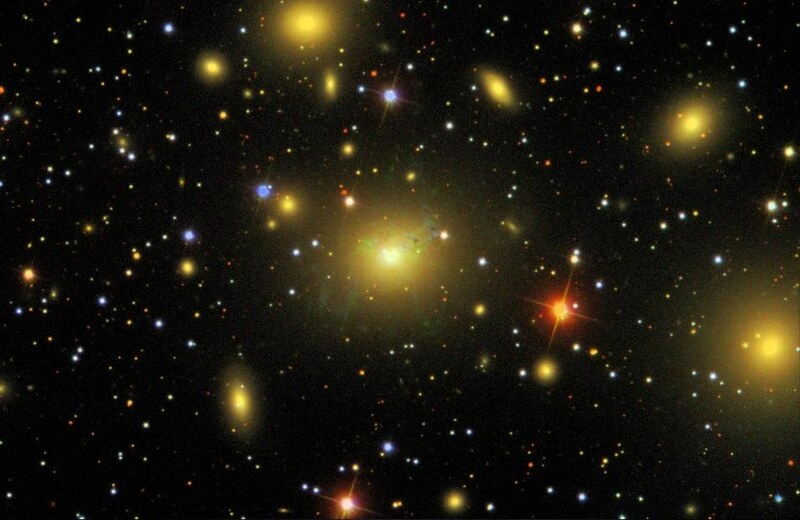 "Although this is just one example, there's no reason to doubt that this similarity could extend beyond our Sun and the Perseus cluster to other galaxies with different properties," said coauthor Kyoko Matsushita, a professor of physics at the Tokyo University of Science. Although short-lived, the Hitomi mission and its revolutionary SXS instrument --developed and built by Goddard scientists working closely with colleagues from several institutions in the United States, Japan and the Netherlands -- have demonstrated the promise of high-resolution X-ray spectrometry.